​Things we like best. Wow...where to begin? The cottages are absolutely private, on a lovely pond, which is perfect for swimming and playing about in the canoes and kayaks. The accommodations are immaculate, up-to-date, bright and pretty. 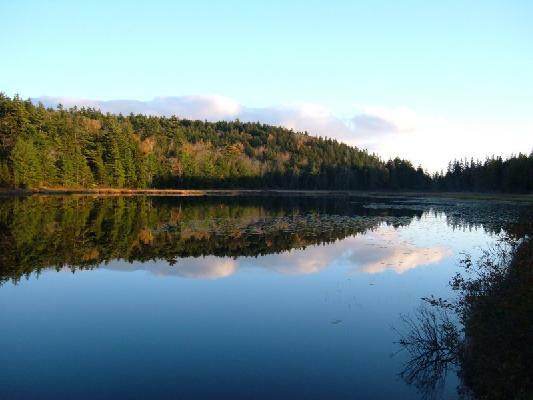 Most important, Hodgdon Pond is situated within easy access of Acadia National Park and the myriad wonderful things to do in and around that area. We could have easily kept ourselves and the children busy for two weeks, instead of the one we had reserved. We would recommend staying at Hodgdon Pond Farm because of: lovely accommodations that are well-maintained; restful , peaceful setting; many, many wonderful things to do in the area. The rate includes utilities except international or three-party phone calls, Pay-per-View through Direct TV, and more than 3 gigabytes of data per week. Excess will be charged at $15.00 per GB. The rate does not include the Maine sales tax of 9%, or the cleaning fee of $100. The rates cover occupancy by six people. Occupancy is limited to seven people, and there will be a charge of $250 for a seventh person.